Two ancient horse figurines discovered by mushroom-hunters and locals after winter rains. Two horse figurines were discovered last month in Northern Israel. The first, discovered near Kfar Ruppin in the Beit She’an Valley, is about 2,800 years old and dates to the Iron Age. The second figurine is Hellenistic, some 2,200 years old, and was found nearer the coast at Tel Akko. Both the horses were exposed by heavy winter rains, and discovered by civilians who aptly informed the Israel Antiquities Authority (IAA) of their discoveries. The figurines have been added to Israel’s collection of National Treasures. In appreciation of the civilians’ good citizenship, each will receive a certificate of recognition from the IAA. “I went with my daughters Hadas and Maya to collect mushrooms in the area of Kfar Ruppin," Ayelet Kidder-Goldberg recalls. “We didn’t find any mushrooms.” What they did find, however, was a more rare and exciting discovery by far! “Suddenly,” Kidder-Goldberg says, “my daughters picked up this beautiful figurine from the ground…We were very excited!” Being an IAA Archaeologist herself, Kidder-Goldberg immediately recognized the artifact as an Iron Age figurine. The decorations on the clay horse head are characteristic of the Iron Age II (mainly the 9th-7th centuries BCE). Red paint was used to detail the horse’s reins and harness. The conical shape of the mane is also an Iron Age feature. Resting on the horse’s neck is the hand of a rider, also painted red. This indicates the complete figurine would have depicted a horse and rider similar to some other sculptures from the same period. According to Dr. Adi Erlich of the University of Haifa, the use of horses in the Ancient Near East was greatly increased during the Iron Age. Chariots are mentioned in several ancient literary accounts including Pharaoh’s pursuit of the Israelites in Exodus, and Deborah and Barak’s battle against Sisera in Judges. 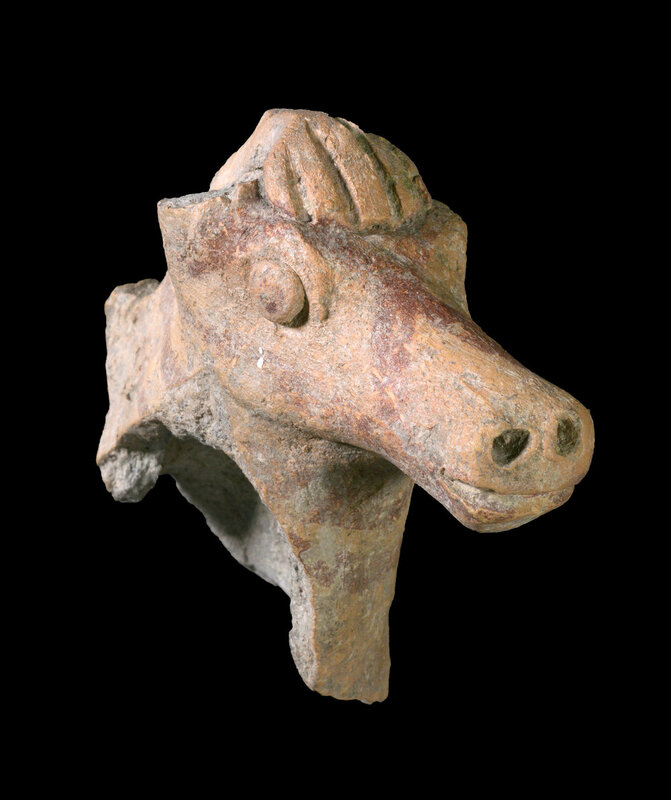 Erlich says that “Horse figurines were common in the Land of Israel in the first millennium BCE,” including horse-shaped vessels used for holding liquids. There is some question among scholars as to why the horse and rider was such a popular icon in this period. What were the figurines meant to represent? Some understand the sculptures as military imagery, assuming the horse’s rider was a soldier. Others suggest the figurines represent people of a high social status. This hypothesis reasons that only wealthy individuals could afford horses. In either case, Erlich says “It should be noted that in our region, almost only men were depicted in figurines on horseback…which attests to gender roles in Iron Age society. A similar discovery was made nearer Israel’s coast, at the ancient site of Akko. Michael Markin discovered a clay horse head also decorated with red paint, and promptly informed the IAA. Once in the hands of the IAA, archaeologists determined this second figurine was a somewhat later creation, dating to the Hellenistic Period (3rd - 2nd centuries BCE). While similar to the horse discovered near Kfar Ruppin, the Akko horse’s harness and ears were made from separate pieces of clay added to the sculpture. Although only the horse’s head was recovered, according to Dr. Erlich most horse figurines from the Hellenistic Period had riders as well. Michael Markin and Ayelet Kidder-Goldberg and her daughters will receive certificates of recognition from the IAA for reporting their discoveries so they could be preserved and studied.